Mon., April 4, 2016, 7:53 p.m.
INDIANAPOLIS – Breanna Stewart came to UConn with the lofty goal of winning four national championships and the Huskies are now just one victory away from history. They will play former Big East foe Syracuse on Tuesday night with a chance to become the first women’s basketball team to win four straight Division I titles. 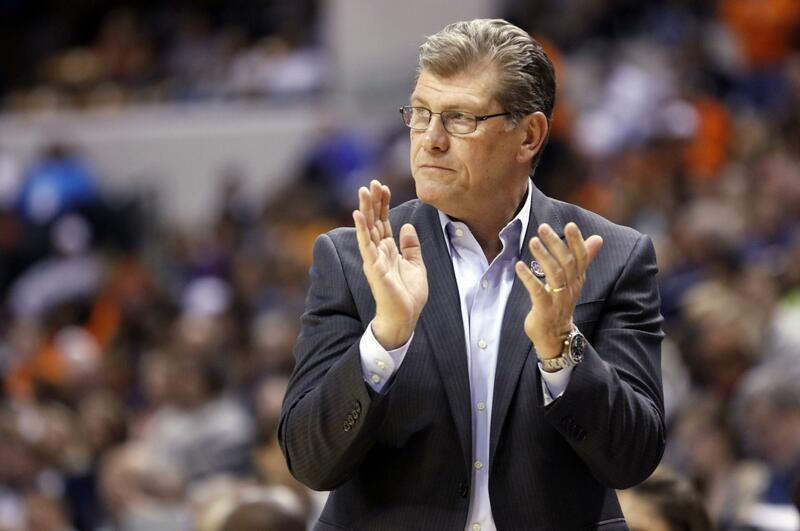 Only UCLA, with seven in a row from 1967-73, has done it on the men’s side, and a UConn victory would give coach Geno Auriemma 11 national championships – one more than Bruins coach John Wooden for the most ever in the history of college basketball. While Stewart didn’t guarantee four titles when she was a freshman, she did promise a victory against Syracuse. Syracuse coach Quentin Hillsman wasn’t planning on using the comments as extra motivation for his team. Stewart and her fellow UConn seniors have won 74 straight games and have never lost in the NCAA tournament, going 23-0. To win the title, Stewart and the Huskies will have to beat her hometown team. The former Big East foes met at least once a season before the Orange went to the Atlantic Coast Conference after the 2013 season. The Orange have lost their last 23 meetings against UConn, a skid that dates to 1996. UConn is 10 for 10 in title games. Auriemma also said that it helped having players like Diana Taurasi, Maya Moore and Stewart. Syracuse has been stellar in the tournament from behind the 3-point line. The Orange have made 48 3-pointers in the NCAAs, averaging nearly 10 a game – up one from the regular season. They are also making 33.6 percent from behind the arc, up 4 percent from the regular season. UConn will be without freshman Katie Lou Samuelson, who broke her foot in the semifinal win over Oregon State. Hillsman said Syracuse men’s coach Jim Boeheim has been one of the team’s biggest fans. While he didn’t think Boeheim would be at the game Tuesday night, he has been offering support. Published: April 4, 2016, 7:53 p.m.